I am glad to announce as of October 2006 Gypsie is about 95% back. She is getting better all the time. Rolfing sessions have been helping quite a bit. 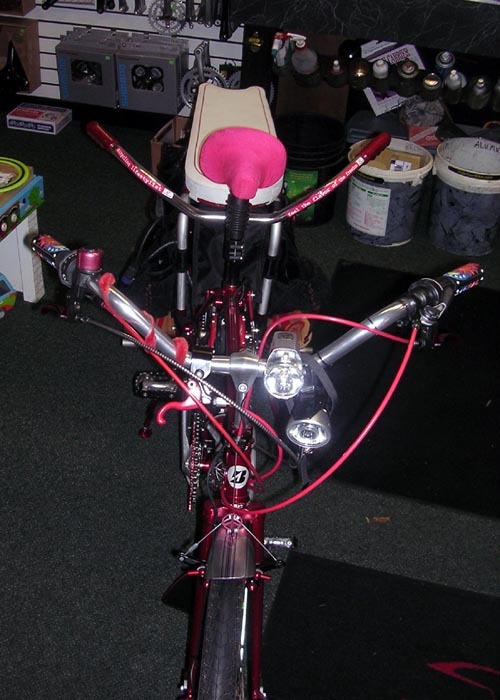 Her bike is fully repaired and better than new. She is riding it again with much joy. She knows that cars will NOT stop for you so she is more carful now. Snake Hill (a.k.a. 30th Avenue SW will never be the same, but it is still a fun down hill, even if we now slow way down at the intersection of SW Findlay Street, where she was hit. Her is her New Xtracycle! On Tuesday, March 14th at about 8:14 PM, Gypsie was struck by a hit-and-run SUV driver on 30th Avenue SW (aka Snake Hill). I was riding ahead of her with Braxton on my bike. She was following me northbound when a man that did not speak English (How did he get a drivers license?) blew thru the intersection with SW Findlay Street. He knocked her off her bike and thru the air where she landed near the NW corner street sign. He did not stop and ran over her bike, crushing it. In his attempt to flee, he hit another car. Many neighbors came out when they heard Gypsie's screams and stopped the man from getting away. The police took him to jail for a double felony. The INS may deport him! He was taking his 13 year old son home from soccer practice! **Update Spring 2007. Gypsie is still in constant dull pain, and may be for life. It is hard for us to have sympathy for the Spanish-speaking fellow that ran her over. He has been in the USA for only 6 years and has had 4 problems with the law. We were compassionate to him and did not request deportation like the prosecuting attorney wanted us to do. The judge told us we were very kind in that regard. He even granted him work release so he could start to pay Gypsie back. As of 3-13-07 he has not paid a single dime! Washington law requires him to pay restitution and the state will pay us in $10 increments. His race has nothing to do with our opinion of him, however, we feel that ANY person that goes to any other country to live should learn the language (or at least try, he had to have a translator and English is not a hard language to learn from Spanish, not at all hard like say, Chinese!) AND OBEY THE LAWS! He did neither. Gypsie was taken to Harborview where she was treated for a broken pelvis. She spent 3 days in traction in ICU but kept having her surgery delayed because she was stable. Her surgery went as planned with no complications. She is expected to make a full recovery in 3 to 4 months. Update 3/22/06 :Gypsie is due to leave the hospital Thursday, March 23rd. 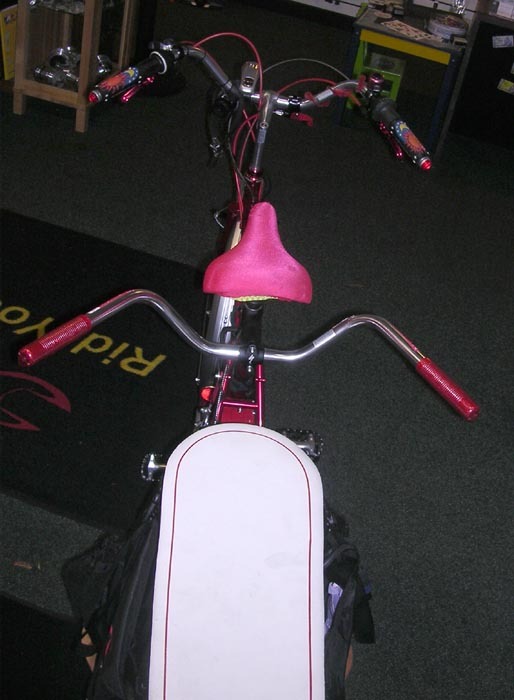 She will be staying in an apartment above the bike shop until April 6th. She has started to walk around with the help of a walker and her bowels are returning to normal. She is off of the IV and eating solid food again! She expects to be pretty weak for a week or two. I suspect that she will be back at the bike shop at her desk in a few weeks but probably not walking around to ring people up very soon! She plans on doing massage again, but right now she is going to need massage! Until then, we have put a laptop in the apartment to let her keep connected. My mom (Gail) is staying with her for the next 10 days. Please refrain from emails and phone calls for the time being. It makes it easier at the bike shop since we are short one worker too! Everything looks good for a full recovery. I will post X-ray pictures here for your morbid curiosity! Actually, they are pretty cool! 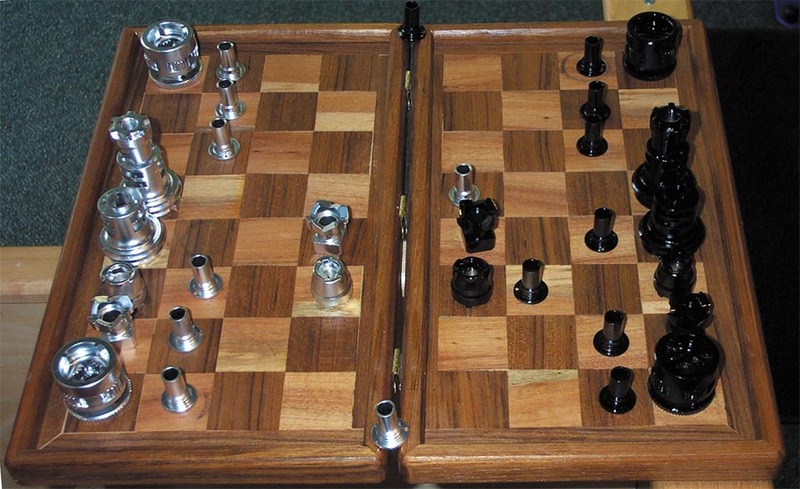 Stainless steel screws and a plate. I helped her walk over to the window in the hospital room today, then back to the bed. She said she felt like she just did a marathon! She looks great and is in much better spirits. It sure is hard to see someone you love hurt so bad. Hospitals are hard places to rest & heal with someone coming in every half hour to check on you or take your blood pressure, etc. Everything has been better than normal except for a slightly low red blood cell count, but that is considerd OK because she lost some blood during the sugery. 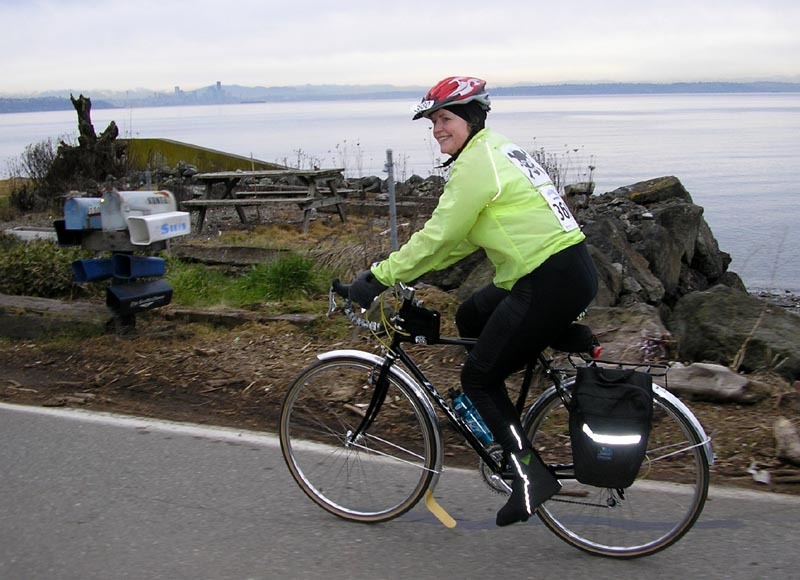 On a sad note, our customer Marv Miller was the bike rider killed near the First Avenue South Bridge in Seattle recently. Please do not send flowers. Gypsie asks you, instead, to donate the money you would spend on flowers to Bike Works. Gypsie and I ask you to drive your car as little as possible and remember: It is cars that are dangerous, not bicycles! The more cyclists that there are on the road, the more drivers will remember to look for us! Update 6/7/06: Gypsie is healing fine and is now walking with the help of a cane. Life is returning to normal. She can put her full body weight on her left leg. The muscles are starting to regain strength and she can now drive our stick (clutch) pick-up truck. 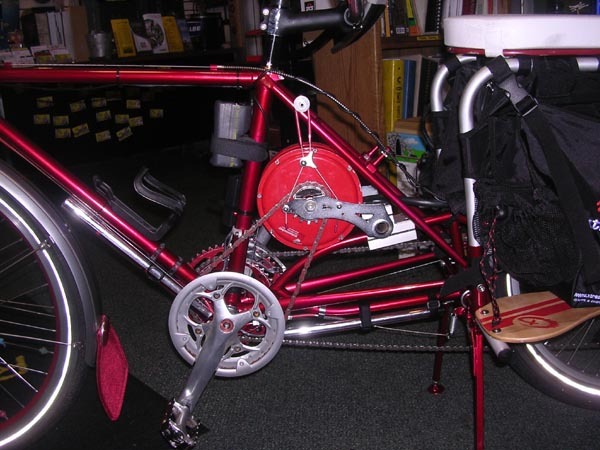 We purchased her the Sun EZ-3 recumbent trike to use until she was fully recovered. Aaron installed a Stoke Monkey on it to assist her.